I started my first garden with my mom’s help when I was a teenager- it was a little square plot filled with salad veggies and Hershey’s cocoa mulch. I loved getting my hands in the dirt and watering my plants in the morning- but, as my mom can testify (and now my husband too), I still had a tendency to inadvertently kill things. Over time, my husband and I have tried different types of gardening techniques. We started with a failing pot garden in full scorching sun, then moved to a smarter pot/flower-box garden at our next place. By that time my husband was gaining a lot of plant knowledge and experience from working at a hydroponic basil farm, so he took the lead in thinking about soil composition and plant care. Over the next couple of years, we tried a few different ground gardens. Tim has experimented drainage systems for our first saturated garden, and swales and hugelkultur beds for our current hilly yard. (Hugel-what?!? I know, that’s what I said too.) He’s learning about proper seed starting, succession planting, natural pest control, and how to build rich soil without tilling. But we’re still only scratching the surface of all we want to know about growing things in our own yard. And that’s not to mention the other home-grown food sources we want to learn more about. Fruit trees, nuts, honeybees, chickens, and maybe meat rabbits too. There’s so much to read and practice- it can be rather overwhelming at times. That’s why I’m SO excited about the Homegrown Food Summit coming up this week, from April 6-12. 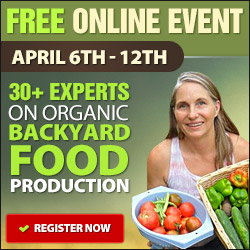 It’s a completely free, online educational event that will cover multiple aspects of growing and raising some of your own food at home- whether you have an expansive homestead or a small backyard. It’s such a “good pick” that it completely replaced Good Pickins’ this week. The sessions I’m most interested in attending? And there’s more too! Topics like growing greens, raising chickens, straw bale gardening, hunting, canning, and aquaponics are also on the list. There’s even a session on eating and enjoying insects! It takes all those things that I really want to learn about and puts them in one place. How Much Land Do You Need to Be Food Self Reliant? I am thrilled to get the chance to learn more skills to improve our little homestead. Once you register here, the folks at Homegrown Food Summit will send you a schedule of events and your free e-books. Spread the word! Growing your own food is wonderfully rewarding! This entry was posted in Homestead and tagged Homegrown Food Summit, Learning to Grow & Preserve Our Own Food on April 4, 2015 by Abi. That top photo of you guys is ad-dor-a-ble! !